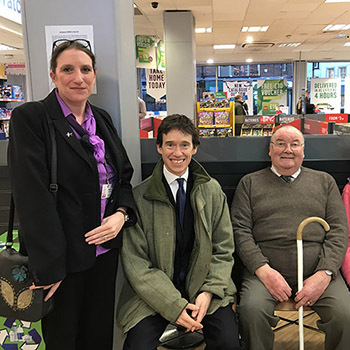 Older shoppers were celebrating this week after Rory Stewart MP joined Anchor’s Standing Up 4 Sitting Down campaign. Mr Stewart, MP for Penrith and the Border visiting his local Argos store said he was delighted to add his name to the growing list of supporters. He was originally alerted about the campaign by one of his constituents Michael Baty, who by coincidence is a resident at Anchor’s Retirement Housing Scheme in Brackenber Court, Musgrove Street, Penrith. In his letter to Michael, Rory Stewart wrote: ‘I absolutely approve of the move to try and persuade shops of the benefits of providing more seating for older shoppers, and as a direct result of your letter, I have been in touch with Anchor for more information and to lend my support to the campaign. ‘Thank you once again for bringing this to my attention, and for all your hard work on launching this brilliant initiative in the Penrith area’. Michael and his wife Evelyn, both 79 are two of the more active members of his Housing Scheme, helping run the residents’ committee and organising numerous events. Michael said: ‘I saw the campaign launched last year and thought it was important for key people such as Rory Stewart to add his weight to it locally. I had open heart surgery 10 years ago so I can only walk short distances but Evelyn and I love going shopping so to know there are all these outlets where we can have a rest is so helpful’. In the last month two more high profile high street retailers have joined up too. More than 80 Virgin Money stores and 600 Argos outlets have now signed up bringing the total number of retail outlets to more than 2,000 accounting for over 4,000 seats.